A homemade version of the Girl and the Goat grilled broccoli from chef, Stephanie Izard’s restaurant in Chicago. One bite and you’ll never want to eat broccoli any other way. 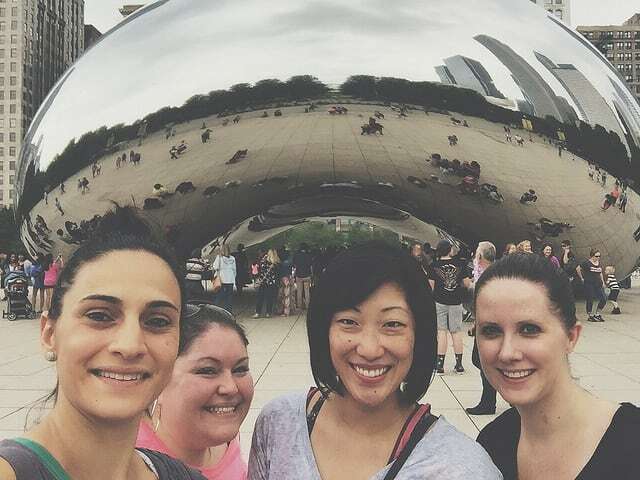 Back in June, Julie, Rachel, Brandy and I hit the streets of Chicago for 3 days of what should really have been called the “2015 stuff our faces with everything delicious tour”. It was 72 hours of pure eating bliss starting with a “light” meal at The Purple Pig before our “let’s spend more on dinner than our mortgage” night at Alinea followed by Frontera Grill, The Kitchen, Siena Tavern, Eataly, Girl and the Goat and Pequods (had to fit some deep dish in!) for the remainder of our time. In the end though, Girl and the Goat was definitely the most memorable of all the restaurants (which was an unexpected surprise given the hype of Alinea – a 3 star Michelin rated restaurant ranked #9 in the world in 2014). From the vibe, to the food, to the excellent service. The fact that a plate of broccoli has stood out in my mind for the last 4 months since is a testament to that. We (well, more so Julie because she’s the most type A of the group) researched the heck out of our restaurant options before this trip, thanks to TripAdvisor. Seeing their Traveler’s Choice Award on Girl and the Goat, made our decision to include it in the eating frenzy even easier. Going into the night based on all the awesome reviews on TripAdvisor and from friends who had been, we knew we wanted to 1. try and get the goat (didn’t happen) and 2. order the broccoli and green beans if they were on the menu (it changes seasonally). Maybe it was the universe telling us we needed some vegetables in our lives on our last night in town but the green beans and broccoli were both on the menu and both ended up being favorites of the table. 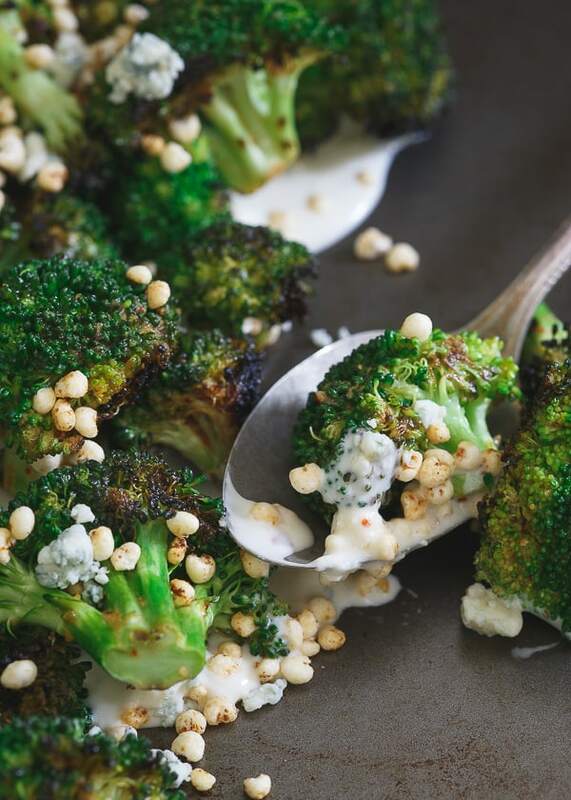 Stephanie Izard (the chef/owner) actually shares this broccoli recipe online which really helped in recreating the dish and all it’s amazing flavors at home. I knew the blue cheese base, broccoli and crisps on top would be easy to replicate but the vinaigrette is where the magic is. With spicy harissa (mmm, love that stuff – like in this harissa sweet potato hash) and sriracha, a bit of soy, lemon and vinegar, it’s a combination that is so unique and just works so well in contrast to the creamy blue cheese sauce. I made a few changes, twists to my homemade version using puffed millet instead of rice krispie cereal, yogurt in the blue cheese sauce instead of sour cream and a few tweaks to measurements. All in all though, this homemade version tastes just like it did in the restaurant. All that’s missing is someone serving it to me and the company of great friends. Planning for the “2016 stuff our faces with everything delicious tour” will commence shortly and I know we’ll (Julie) be back on TripAdvisor reading reviews, looking at pictures and researching the heck out of the restaurants in our next location. ps- If you want to see Brandy’s recreation of the Girl and Goat Magic Beans, check out her post! A homemade version of the Girl and the Goat grilled broccoli from chef, Stephanie Izard's restaurant in Chicago. One bite and you'll never want to eat broccoli any other way. 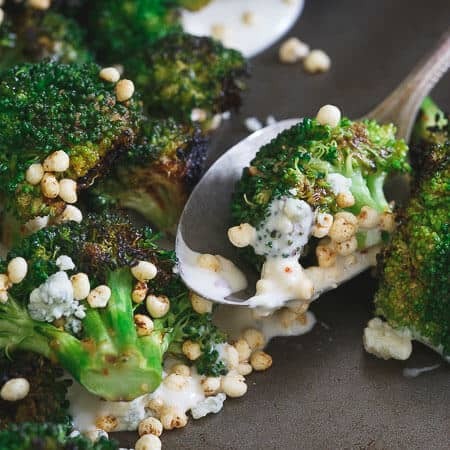 Assemble the cream cheese sauce first by combining the heavy cream, 1/4 cup blue cheese crumbles, sugar, salt and pepper flakes in a small sauce pot over medium heat. Stir until the blue cheese crumbles melt. Remove from heat and add the yogurt and remaining blue cheese into the sauce, stir until well combined and set aside. Make the vinaigrette by combining all ingredients except olive oil in a small food processor blender. With the machine running, slowly pour in the olive oil. Turn off and set aside. Make the crisps by melting the butter and vinaigrette in a small skillet over medium heat. Once melted, add the puffed millet, toss to coat in the butter mixture and toast until crispy and starting to turn golden. Remove from heat and set aside. Toss the broccoli florets and 1/2 cup vinaigrette in a medium bowl until well coated. 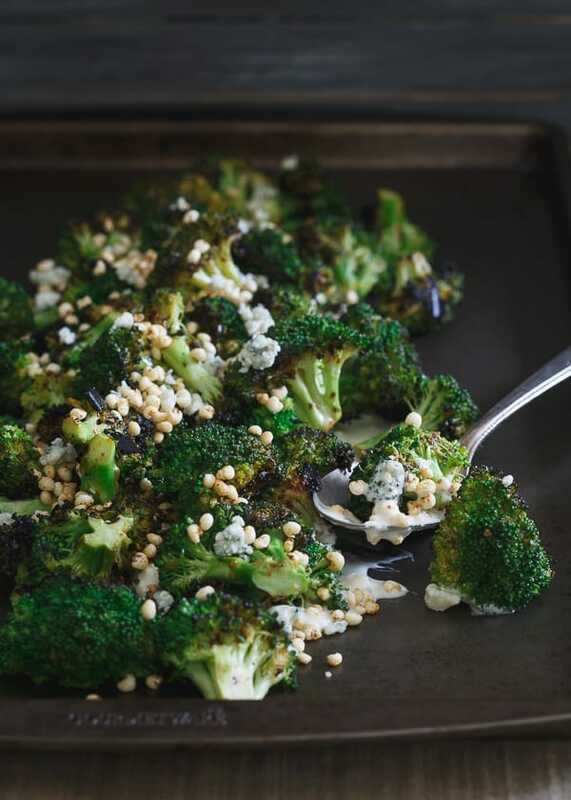 Grill broccoli on an indoor grill pan or outdoor grill until charred on each side. To serve, spread the blue cheese sauce on the bottom of a serving plate. 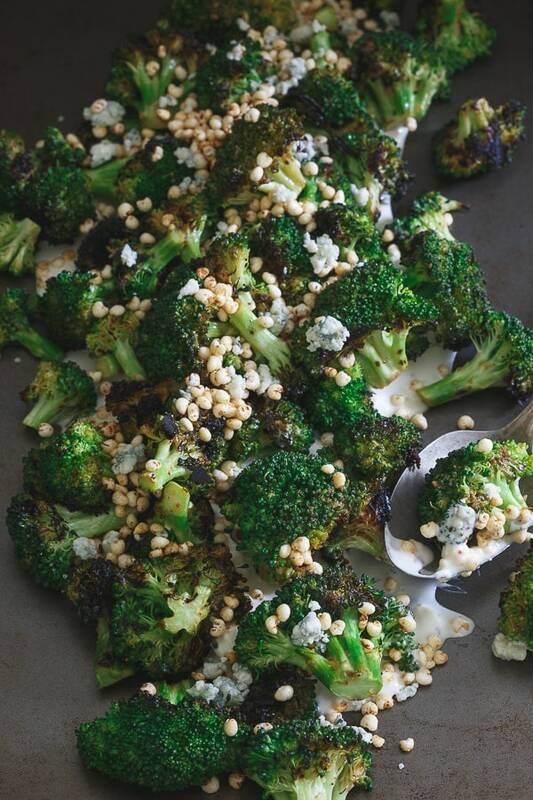 Place the grilled broccoli on top and garnish with the toasted crisps. Best eaten immediately. Slightly adapted from Stephanie Izard. *This is a sponsored post on behalf of TripAdvisor. I was compensated for my time. All opinions and content are my own. I could go for a huge plate of this right now! I love everything from Girl and the Goat and Little Goat, across the street. I cannot wait to make this in case I don’t get a chance to go backfor a while. I live in Chicago, you would think I go there all of the time… but no. I should change that asap. We tried to get reservations at Girl and the Goat for our anniversary but they were booked. We need to get back up to Chicago soon, but till then, I’ll enjoy this spectacular broccoli!! Yum!!! I love the fusion of so many flavours in this dish. You know it was a good meal when it’s still thinking about it months later! I haven’t eaten there but after looking at your recipe I can imagine why! It looks fantastic! I ate my way through Chicago last year but I never made it to girl and the goat!! Now I’m seriously regretting it lol this looks amazing and I’m so excited I can make it at home! The broccoli looks amazing! I could not stop thinking about the green beans after I left Girl and the Goat. Need to figure out how to make them. I ate at Girl and The Goat last February. Everything we had was absolutely delicious!! Thank you for sharing her recipe with all of us.